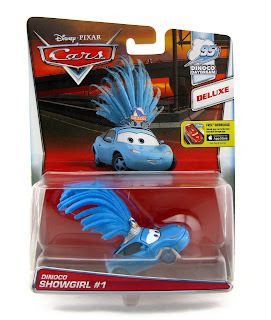 From Disney·Pixar's Cars, here we have the newly released Mattel 1:55 scale diecast of Dinoco Showgirl (#1)! This "Deluxe" size character has just hit stores and is part of the 2016 "Dinoco Daydream" sub-series (#4/9). This is the first time this character has been released on a single card. Before now, both Dinoco Showgirls were only available in a 3-Car gift pack from a while back (seen HERE). You can count on Dinoco Showgirl #2 to show up later this year. 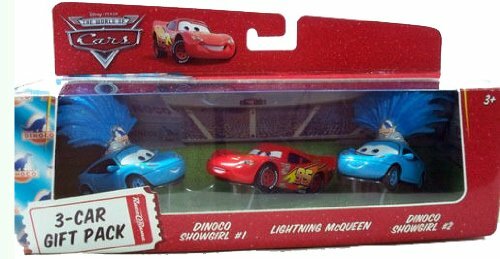 In the film, the Dinoco Showgirls are seen in both Lightning Mcqueen's Dinoco daydream and nightmare, as well as when The King is trying to offer Mcqueen some advice after the opening race. You can find this one in stores now. Be sure to head to your local Target, Walmart or Toys R Us to check for availability! Or you could check out current eBay listings HERE or visit Amazon using the direct link below. Happy hunting!